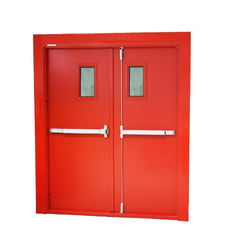 We are exporters, supplier, and manufacturer of 1 hr and 2 hr Fire Rated Doors. These Fire Doors are Manufactured as per the IS 3614 standards for being used in Complexes, High Rise Building, Hospitals where Provision of a Fire Door is Mandatory. These Doors are made of GI Sheets (Zinc Coated Sheets) which are Sturdy and resistant to Heat, Rust, Corrosion and Termites. These Doors are Hallow Metal Doors filled in with Mineral Wool which is an Insulating Material. These Doors are PU Powder Coated to improve the Elegance, Look and Life of the Door, These Doors are available in Single and Double Door Range with 1 hour and 2 hour Fire Rating. As the name indicates, these doors are very rugged and act as insulators and fire Retarders during Fire and will not allow? Heat,Flame or Smoke to pass through for the specified time as per their rating. These Doors are fitted with good quality Fire Rated SS hardware to increase the life of the door and to make it a trouble free unit. Looking for Fire Doors ?